When using the start link - end link operation multiple times in most cases the same relationship (link type) is needed. Always selecting the relationship from the dropdown menu is very time consuming. 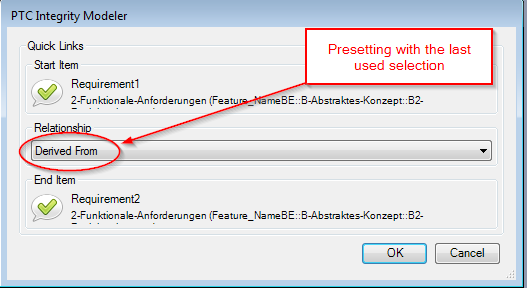 The suggestion is to preset the relationship with the last used selection (instead of just using the first entry of the list). Thanks for the idea, I have added this enhancement to our database (ID ART18-2131081). We will consider for inclusion in Integrity Modeler 9.1.